Developing quality relationships with governmental leaders in Sacramento is prudent especially now, with a lingering uncertain economic climate, and evidenced by the ongoing threat of a proposed service tax on golf and a serious reduction of vital resources such as water. CAG has retained the well-respected firms of Englander, Knabe & Allen and Rice-Englander as its public/legislative affairs advisors. 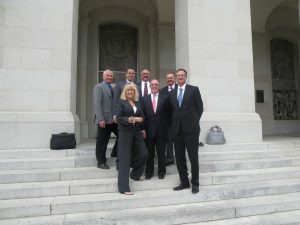 With offices in Los Angeles and Sacramento, they continue to keep the Alliance abreast of the legislative, regulatory, and public policy issues that affect the statewide industry. Additionally, the alliance recognizes the importance of involvement at the local and regional level. This is evidenced by the recently formed Golf Industry Water Conservation Task Force in Southern California, collaboration between technical experts from the golf industry and the Los Angeles Department of Water & Power. The task force goal is to study water consumption and conservation patterns, develop appropriate baselines, and explore the concept of banking water credits, serving as solutions/recommendations for the Emergency Water Conservation Ordinance. CAG remains committed to educating governmental agency representatives and elected officials on golf’s’ vast benefits as they relate to environmental stewardship, community health & wellness, and its positive economic contributions within the State of California.